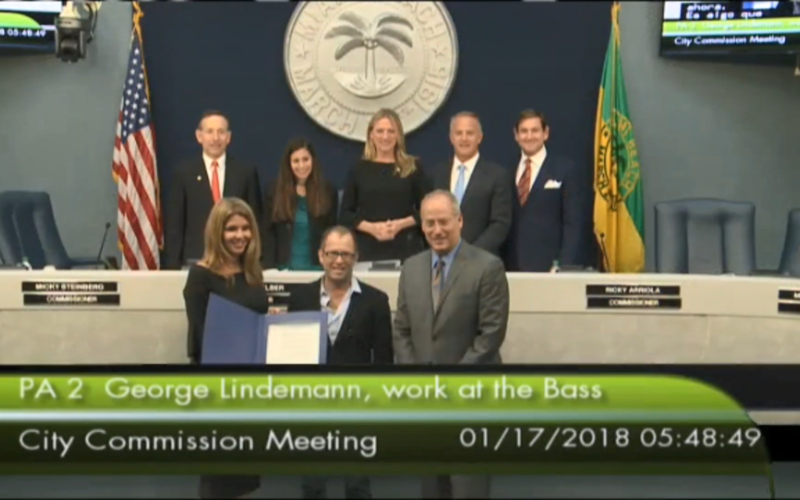 December 13th was George Lindemann Day in Miami Beach - George Lindemann Jr.
On December 13, we celebrated George Lindemann Day in Miami Beach – a thank you for my efforts over the last nine years on behalf of the Bass Museum. Not only did I officially get my 15 minutes of fame, but I received my City of Miami Beach Commission certificate and some very kind and eloquent words from Commissioner Rosen-Gonzalez. So many people worked so very hard to reopen the Bass Museum, and this past fall, we were able to reap the benefits of all this hard work. • The museum budget grew from $600,000 to over $3 million. • Our new and improved building has 50% more programmable space than our old building – all within the same existing footprint. • We were awarded multiple prestigious grants from national foundations such as the Knight Foundation, the Kellogg Foundation and the National Endowment for the Arts. • Attendance has grown from 12,000 to 75,000. • The board grew from just three members to 30 active members who helped raise nearly $5 million towards construction of the new space. Perhaps most importantly, this past December the Bass presence on social media was overwhelming. While we don’t have software to accurately count, a manual assessment showed nearly one million likes or views on Instagram and Facebook of Bass images. This does not count the amazing mainstream media reception of our new facility and three current shows: Mika Rottenberg, Ugo Rondinone and Pascale Martine Cayou. All of these statistics are interesting for assessment purposes, but if you haven’t been, you really need to go see the new museum. And make sure, please, to post a clown selfie!